Ricardo Lumengo is proud to be the first black man in Swiss Parliament: “I am a black sheep that was elected.” This is how the lawyer from the watch city of Biel presented himself to the ‘Bieler Tagblatt’. 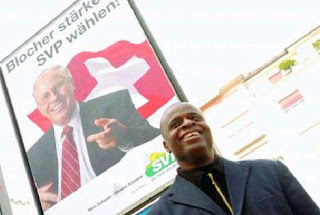 The newspaper then talked to the president of the regional SPP (Swiss People’s Party) about Lumengo: “Switzerland has become increasingly multicultural.” And he does not believe the choice of Lumengo to be a reaction of the voters against the controversal “SVP-Plakate” (SPP black-sheep-posters). “His great popularity was the decisive factor,” he added without mentioning what made him so popular. Who is the native Angolan? Lumengo rapidly climbed the political ladder: The 45 year old lawyer has been a member of the City Council of Biel for three years. Last year, he was elected as a member of the Cantonal Parliament of Berne. And now, he is even entitled to represent the region of Biel in the Swiss Federal Parliament, together with the governing Mayor of Biel, Hans Stoeckli, for the four years to come. Both are members of the Social Democrats (SP). “I am very pleased about my election”, says Lumengo, “especially after the attack of the ‘Freiheitspartei’ ” (FPS, the regional ultra liberal party by police director Erich Scherrer). Lumengo calls this a “great satisfaction”. After a car crash, the said FPS reported him for “violation of duty” and called him a lier on their website. Lumengo got fined for that. He is now convinced that his election was a response of the citizens against the campaign of the SPP. “I am a black sheep that was being elected”, he says with regard to the controversal posters. Lumengo wants to fight for the rights of foreigners and for their integration into Swiss society. He also keeps in mind the education system and the prevention of unemployment. After having received a permit for stay as a political refugee, Lumengo studied law at the University of Fribourg, and now works as a legal consultant at the intercultural centre “Multimondo” in Biel. Swiss Elections 2007 Result Update 22-Oct-1:00 p.m.